Back in the early years of the Cold War, America started construction of a secret underground base in Greenland to house nuclear missiles within range of Moscow, kind of like our cold Cuba. In the 1960s we figured out that it wouldn’t work, so we peaced out without telling anyone or removing any of our nuclear waste, now chillin’ under a hundred feet of ice. Ice that, we now know, will soon melt thanks to climate change. The place is called Camp Century. It’s not too far from our Thule Air Base but it’s not too close to, well, anything else. It’s 124 miles inland from Greenland’s northwestern coast, and it was built in ‘59 under what was then about 25 feet of ice. The idea was to make a base completely under the ice and house nuclear missiles there in secret within striking distance of Moscow, as I said before. We left behind, however, a 53,000 gallons of diesel fuel, about that much waste water, and an undetermined amount of nuclear waste, as a new report from The Guardian explains. The reason why there’s a new report on a half-century old secret nuclear site a couple hundred miles north of the Arctic Circle is because in that half century, we have learned about a thing called ‘climate change.’ Originally we thought that everything about our secret base would be preserved for eternity. We (along with international researchers) now realize that the ice currently entombing our old waste will at some point melt. Luckily for us, that melting point is a reasonably long time away. Snowfall up there in northern Greenland is greater than snowmelt at the moment and it has been for some time. What was 25 feet of ice covering Camp Century back in 1959 became about 40 feet by the mid-60s when we planned our departure and currently sits at about 114 feet (8m, 12m and 35m, respectively). This won’t last forever, though, and by 2090 we should start seeing the ice melt faster than it’s being replaced, with no exact timeframe expected for horrible and environment-destroying waste exposure. 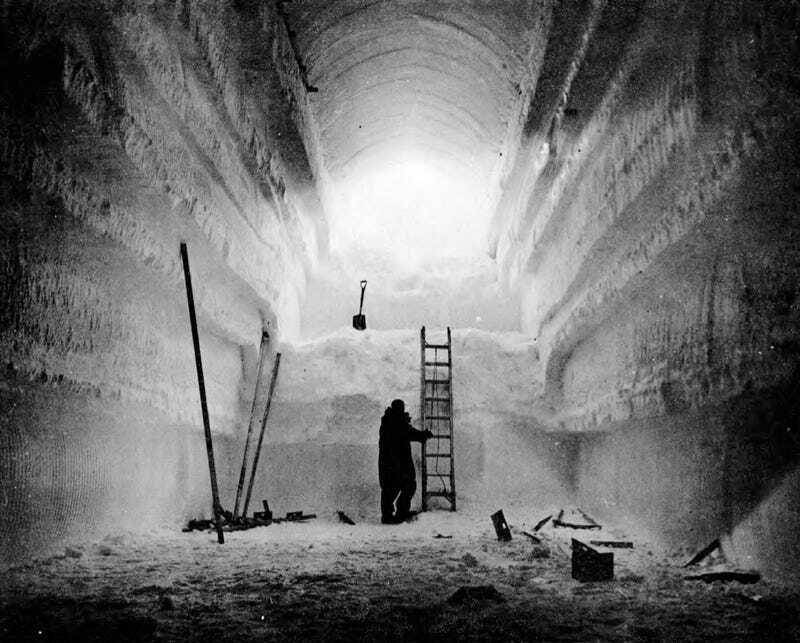 Even more interesting is that the initial cover story for Camp Century was that it was there to study construction in the arctic, and in this work, the U.S. government drilled the first ice core samples used to study climate change. It’s still possible for me to imagine that this base designed to strike fear into our enemies’ hearts will continue to annoy us into doing something good about global warming.